—Citi Bike’s just-announced $2-per-ride fee on its new fleet of electrified bikes will likely become a “barrier” to the very people who stand to benefit the most from an environmentally friendly, lower cost and, simply, better way of getting around the city than a car, a city council member claims. Council Member Antonio Reynoso fired off an “open letter” to the Lyft-owned company one day after it revealed that it would expand its e-bike fleet to 4,000, but also charge a $2 fee to use one of the bikes, which have proven extremely popular because of their ease of use and long range. The fee is $.50 per ride for Citi Bike members who live in NYCHA houses or get food stamp benefits. The $2 fee — waived for Citi Bike members until April 27 — has come under fire from many quarters since it was announced this week, with some foes likening it to a fare hike on what should be a form of public transportation, yet is ostensibly a public-private partnership even though the city allocates no public money. Others reminded that Citi Bike has a monopoly on service, with dockless rivals Jump and Lime only allowed to operate in small pilot zones in the Bronx and Staten Island. And disgruntled non-members pointed out that residents of neighborhoods not currently served by Citi Bike — such as Jackson Heights, Crown Heights, the Bronx and northern Manhattan — would benefit the most from the longer-range e-bikes, yet don’t have any opportunity to get them. Citi Bike officials have defended the fee, in part because the company does not yet know how much it will cost to swap out batteries and maintain such a vast fleet — which will, by the end of the spring, comprise roughly one-third of Citi Bike’s overall 13,000 bikes. And a 30-minute ride on an electric Citi Bike would still be 50 cents cheaper than the same ride on an electric Jump Bike, which cost 15 cents per minute. In a statement, the company said it shares Reynoso’s larger goals of fewer car trips and an equitable system for all. Wood said earlier in the week that Citi Bike would poll its annual members to determine if they would prefer per-ride charges or an additional annual fee above the current $169 if it included unlimited e-bike rides. The company could also charge slightly more, but cap the number of e-bike rides at a set number per month. But the Lyft-owned company may simply not yet know how much it will cost to maintain the newly expanded fleet. Whether one accepts the $2 fee or not, one thing is clear: By adding 4,000 electric bikes into its fleet, Citi Bike is making a strong statement of its vital place in the city’s larger public transportation network — as important an option as, say, Mayor de Blasio’s ferry system, which is subsidized at $6.60 per ride and has far lower user than Citi Bike. Unlike every other form of public transit, Citi Bike gets no public money. City officials have defended their lack of public investment in the past by arguing that the mayor sealed a deal for Citi Bike to expand its overall fleet to 40,000 bikes in five years at no cost to taxpayers. And, a source told Streetsblog, Lyft did not even ask for a subsidy for the e-bike expansion. Reynoso raised such issues in his open letter. Specifically, though, Reynoso demanded to know how the $2 fee was determined and how many riders Citi Bike believes it will affect. Council Member Antonio Reynoso’s letter is embedded below. I would like to raise the possibility that New York City consider funding this shortfall. By subsidizing programs such as Citi Bike, New York City would reaffirm its commitment to long term-sustainably, equity, and quality of life for all New Yorkers. My two cents: I’m a charter Citibike member and I regularly ride ’em — 2,705 trips to date — which doesn’t break any records but I do have some skin in this game. Near-term, slicing and dicing and allocating NYC’s budget, personally, I’d rather see the city’s limited transportation dollars directed to expand bus service and improve subway service. Just my opinion, but Citibike’s unsubsidized status is worth a hell of a lot in the arguement about the burden of bicycles vs. private cars on limited public road space. The flip side: I don’t want to see Citibike tarred with the same brush that can be — rightly — applied to the subsidized ferries. Citi Bike already said in the original press release that people with discounted memberships will only have to pay $.50. I can only think of what I learned about Brazil, the country with the most inequality on earth, decades ago. The constitution of that country “guaranteed” all kinds or rights — weeks of vacation, high pay, early retirement, etc. And free water. But those benefits only applied to those in the “formal sector.” Working for the government, or big corporations. Most Brazilians were in the “informal sector.” The government didn’t have enough money to provide the right to “free” water to everyone, but it did manage to get pipes installed in wealthy neighborhoods. Meanwhile most people in favelas ended up paying up for buckets of private water from a communal tap. That seems to be where the U.S. is heading. Either that or Argentina. 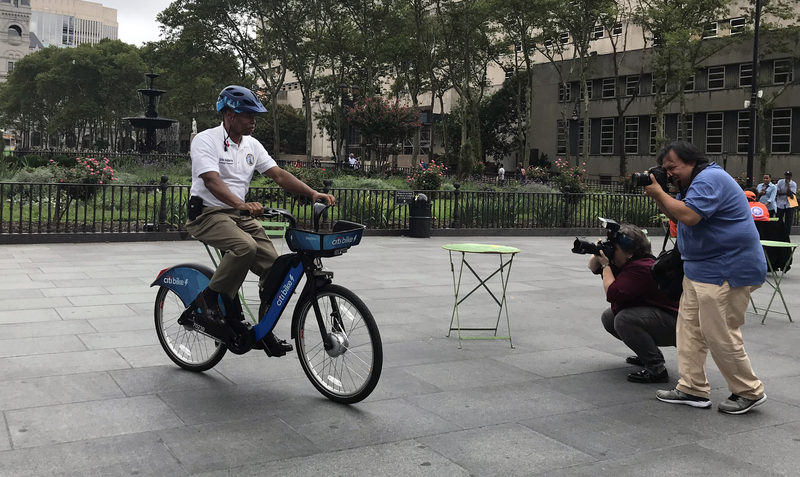 Citibike is in the “informal sector.” The City of New York is in no position to provide bicycles using workers who retire at 55 and start goofing off at 50. It is already providing special low cost transportation for the rich via ferries, even as the subway and bus system breaks down. Politicians need to stop pointing the finger and the cheap and unsubsidized and stop looking in the mirror — and at their list of campaign contributors. he needs to tell taxi companies like uber to make it easier for the poor to take taxis and for whole foods to make it easier for the poor to buy food. also the poor should not have to pay for hospitals. and video game should also be cheaper. thanx, bro! Citi bike continues to be useless for non-gentrified users of NYC, so this really had little effect on those who can’t afford it as it is not even available for them. That’s why citibike shouldn’t be allowed a monopoly. That’s why cycling is not a real alternative for most people who do not have the privilege of working within five miles away from their work in Manhattan. And that’s why powered options like ebikes, motorcycles and scooters should be encouraged and incentivized. The article says CitiBike eBikes would be 50 cents cheaper than Jump Bikes, but Jump Bikes in Staten Island and the Bronx actually cost just $2 for a half hour, then 7 cents per minute after that. This is SIGNIFICANTLY cheaper than CitiBike eBikes (and classic bikes for that matter). A 35 minute ride on a Citibike eBike would cost $8, but just $2.35 on a Jump Bike. the ebike fee means this mode expansion will be financed mostly by people who see it as a better deal than uber and can afford it as such. And thats okay. There will be tons of benefits to the broader transportation network. When I commuted to a place far away from home, biking to the subway station was a good way of shortening my commute, as I didn’t have to worry about the bus. Cycling is useful for stretching the reach of our transit network. Citibike? Heres a new fee, effective immediately (for casual users). Eat it suckers. This is so predictable. NYC’s poor can’t afford a $2 e-bike ride. But at the same time, some of NYC’s poorest (delivery workers) manage to afford to BUY and OWN an e-bike for $1500. Conclusion: if people see value in an e-bike, they’ll find a way to make it work. I found Reynoso’s letter to be reasonable. It’s not Lyft’s place to subsidize transportation. But if the City wants to step up to the plate and be reasonable, I don’t see why Lyft would refuse that money. The letter looks like an exploration into how much it might cost the City. I totally agree. While the city really should subsidize it, when people argue about citibike taking parking spaces, the fact that it is unsubsidized and pays the city a fee for use of those spaces cant be beat. He’s not telling Lyft to make it cheaper for low-income residents. He IS asking how much subsidy might be needed, so he can try to find it from government coffers. Sounds reasonable to me. My big concern here is that the system will have a significant percentage of e-bikes, meaning that it will be entirely possible to show up at a rack that just has e-bikes, because all the regular bikes were taken by people who didn’t want to pay $2. So, even for trips where you don’t want/need an e-bike, you might be stuck either not biking or forking over the $2. Perhaps the fee should be waved if there aren’t any non-electric bikes available. That was my concern too, but it turns out that they will indeed waive the fee if a station only has e-bikes. “What if there are only electric bikes available at a station? It’s telling that City Hall can’t even spell “pedal” correctly. Yeah, but what happens when a rack has a dozen E bikes and only one regular bike. And that regular bike is out of commission for some reason like a flat tire or a broken seat? You’ll take the E bike because you have to but the system will probably charge you because it won’t realize that the regular bike is out of commission. Or is that with the little wrench symbol button on the dock is for? Reporting the bike as out of commission? Or is that for reporting that the dock itself is out of commission? The wrench button is to report a bike as out of commission. When you press the button, the light turns red and people can’t check out than bike until a technician inspects it. I think the system should be smart enough not to count “wrenched” bikes for the purpose of the e-bike fee, but we’ll see. How many poor people who aren’t working as delivery cyclists own $1500 e-bikes? Isn’t a $2 per trip fee for an E-Bike a more affordable option than taking the subway? Wouldn’t this help low and moderate income New Yorkers save more money on commuting by providing a lower cost alternative? Citibike has 150,000 members, so their annual revenue would’ve been around $21 million, from a conservative estimate that three quarters pay the annual $169 subscription and one quarter pays the discounted NYCHA rate. With this ebike fleet expansion, assuming that 4,000 e-bikes are ridden 5 times a day on a $2 upcharge per ride, this one upcharge increases their annual revenue by around 68%. Hoping they pare this back. I’m concerned it cements ebike branding as plaything for rich techbros. And even as someone who’s definitely not poor, I don’t like a 68% surcharge on my weekly price if I decide to ride an ebike across a bridge into Manhattan once a week. Last of all, I don’t see any assurances for improved service or repositioning from this price hike. That would be nice. It seems that many here need to be reminded that not all public transportation needs to be strictly egalitarian. The express buses are faster and more comfortable, and they also cost a bit more. Much cheaper than driving a private car, but still more than a regular bus ride. Taking LIRR from Jamaica to Penn Station is faster and more comfortable than taking the subway. Still cheaper than driving a private car, but still more expensive than the subway. Since you will always be able to get a CitiBike at the regular price (see the discussion about how if there are only e-bikes, there is no surcharge), choosing to spend the extra money on a nicer, faster ride, will be an option for those that want to do so, but not a barrier to those who need to use a CitiBike. The existence of slightly faster, slightly nicer, slightly more expensive options does not mean the end of public transportation as we know it. E-bikes are obviously more expensive to purchase and operate than conventional bikes. There are basically three options: Charge more for a premium option, charge everybody more, or don’t offer e-bikes. Which seems the most fair? First of all, your post is irrelevant to the problem that I mentioned- Citibike is useless for non-gentrified areas. Secondly, people with bicycles in subways take away valuable space from already crowded trains- please do not do that, it’s extremely inconsiderate. Unless, maybe, you get a flat or the train is empty. Oslo gives $1200 in credits to all its residents to buy a ebike- maybe NYC can follow that example. That creates a perverse incentive to “wrench” regular bikes that work fine in order to check out an e-bike for free. I think he’s saying that people who live outside the Citibike service area can take the subway into the Citibike service area and then pick up a bike near the subway to reach their final destinations. It seems that many here need to be reminded that not all public transportation needs to be strictly egalitarian. The express buses are faster and more comfortable, and they also cost a bit more. Yet they’re far more heavily subsidized than the subway and local bus systems, so this might not be the best example. I think it would be impractical to pull that off despite the perverse incentive. I also suspect that management would start to notice if a user has a suspiciously high number of reports, especially if subsequent inspections found that there was nothing wrong with the bikes. Ah, I didn’t realize that. Some people simply won’t have the option to use a regular bike. Not because of availability at a nearby docks, but practicality. Sometimes, I need to travel to a destination far enough away that if I use a normal bike I won’t get there in the alloted 45 minutes, but will if I use an E-bike. Oftentimes schedules dictate that I only have so much time to get somewhere (leaving earlier not being an option), and I can make the trip in time on an E-bike, but not a regular bike. If I have to pay a 2$ to use an E-bike, then I might as well just cancel my membership and use the subway.